Well here is the much promised Smilebox of Amber singing the Apple Poem she learned in Pre-school! After we went apple picking she sang it the whole ride home in the car. I knew I had to find a way to share it with everyone. Im not afraid to be one of those parents who GUSH over their kids! Dont we ALL think our kids are the cutest on the planet? So here I am saying it-she is adorable and would make the cutest commercial EVER! LOL! Hope you like it. I know this is one of those moment that will be so precious when she is all grown up. You have to love the little kid voices they have. If she stays this cute Im in BIG trouble. 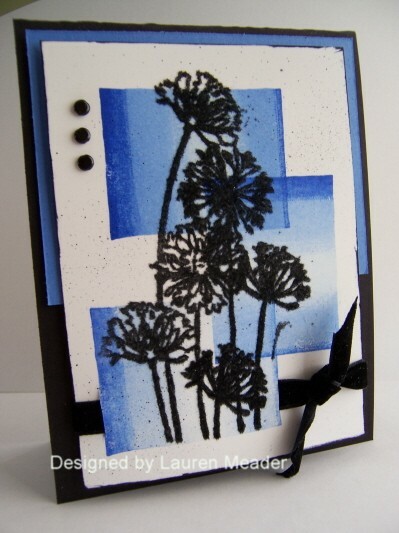 Here is my card in Paper Crafts magazine page 16! Good morning everyone. I haven’t stamped much this week-still in a little FUNK of emotions-but since Football is on later you can bet I will be in my stamp room! Ill be looking around my world for inspiration. We are going Apple picking as a family, so I hope I have energy later! Well I wish there was a secret but its really JUST a drink mixer from Tastefully Simple! Unfourtunately it was a seasonal item and they dont carry it now! Yes bummer! I would just use the mix, milk, and Kahlua blended with ice for a smoothie. TGIFridays Mudslide mix-with a packet of Mocha Blended iced coffee mix (by Archer Farms found at Target in coffee isle), Put in blender with milk, and ice-and YUMMMY!!! I have one every weekend these days! JUST ONE!! Im a lightwieght and no one wants a hangover with 3 kids. SO-Yesterday was an awesome mail day! I got the box from Mary Jo-thank you! She sent Alexa some cards, and her medal for the walk she participated in. How truly awesome of her! 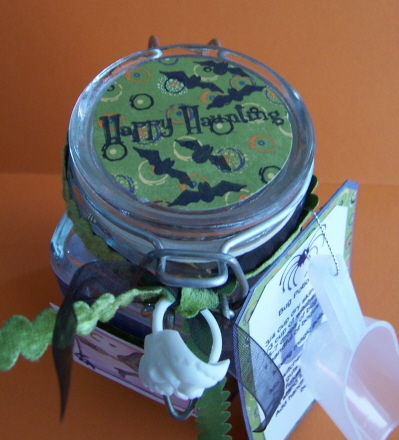 I also got my issue of Craft’s n’ Things October 2007, and I have 2 Halloween themed items in there using Fright Night! Ill give a small peek! Im not going into all the details as they are in the magazine. How cute is that??? 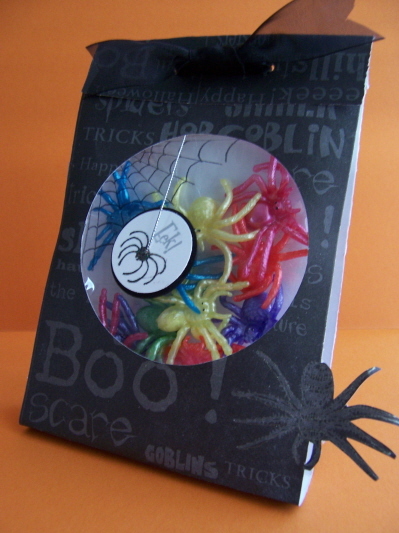 In the magazine they filled it with jelly beans. 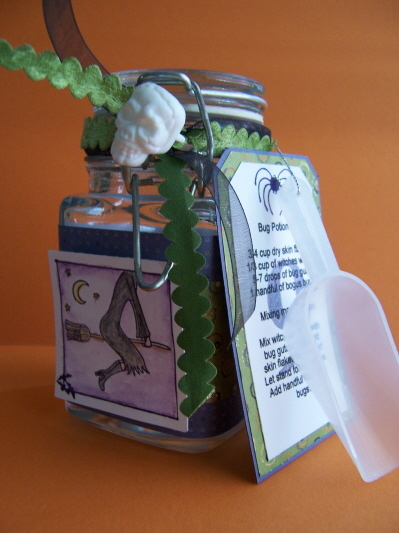 Now the Bug Potion #9 is the actual recipe for SLIME! mix together, let stand 3 minutes. Its a wakcy slime recipe! Let me know if you make it! 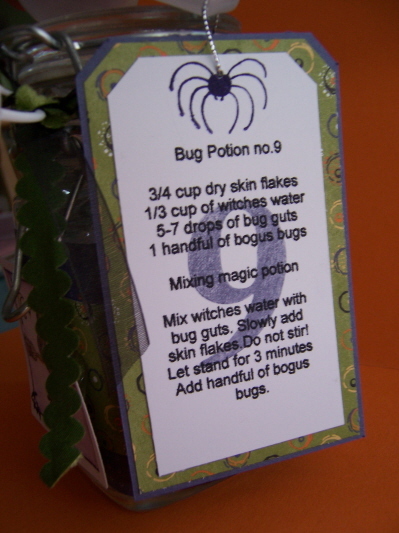 I mixed up the directions for the theme of bug potion. 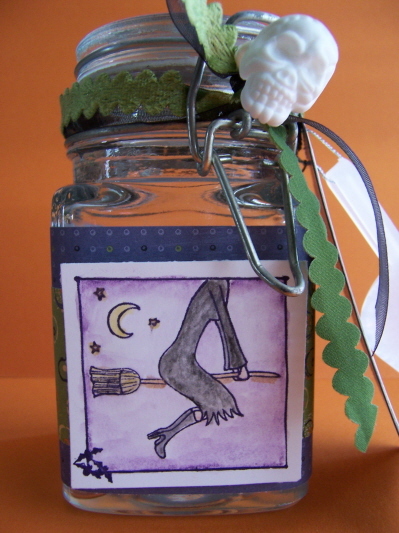 Another cute Halloween treat. See details in magazine. I hope to post them later this month-when its OK! Ok Im off for the day! Enjoy.